The sweater I wrote about in my last post is almost finished. It is now drying slowly, waiting only for the ends to be weaved in and cut. But I’m now doubting wether my friend will actually be able to wear it. Today I washed that purple sweater, let it soak for some twenty minutes in tepid water, and then went on to spread it on a towel and put it into shape. It was huge. And not only that, but washing and blocking made plainly visible something I hadn’t even noticed before : the sweater, made over two different periods of time, is also knitted with two different tensions. See this picture here ? That’s the right sleeve. The colours are awful, and I apologize for that, but what that picture shows is that the sleeves are knit at a much tighter tension than the body. If you look closely, you can clearly see a difference in the fabric density before and after the sleeves stitches are picked up from the raglan part. The lower part of the sleeve seems to be a slightly lighter colour, because the stitches sit tightly against one another, while the upper part appears darker, because there are gaps in the fabric through which the other side of the sweater shows. This is purely a tension issue. Both parts were knit on needles of the exact same size. And guess what ? The tightly knit parts held their shape and size all right. So, blocking here did reveal a serious gauge issue. Is that sweater too big because I blocked it ? Not at all. It is too big because of an underlying problem that was here from the start. Actually, this incident made me really happy that I’m in the habit of blocking pretty much everything. If I hadn’t done it, what would have happened ? My friend would have happily worn it a few times, then washed it, and it would have come out too big. She would probably have thought it was her own fault and she had just ruined, by washing it the wrong way, that nice thing I had taken time to make for her. Could I have avoided it ? Yes, totally. When I began that sweater, I knit a swatch. I measured the swatch. It seemed about right, and I was concerned about not having enough yarn, so I frogged it and cast on. That disaster would never have happened if I had simply taken time to wash and block the swatch. Then my tension issues would have been made plainly apparent and I could either have knit tighter or gone down one needle size. But because I was lazy, overconfident and in a haste to cast on, I didn’t and now have an oversized sweater on my arms. Let’s hope I’ve learned my lesson. 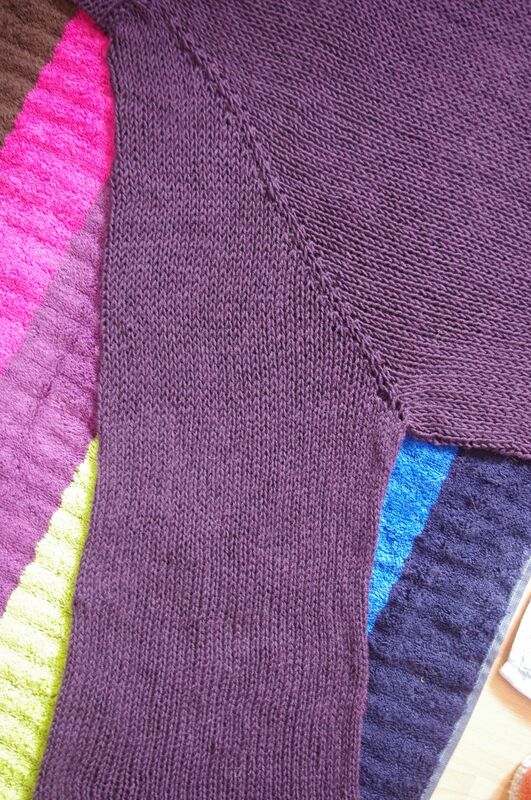 This entry was posted in Knitting and tagged blocking, gauge by Julie Paik. Bookmark the permalink.